Declassified documents have now been published by the National Security Archive (a program of George Washington University) that evidence once and for all that Gorbachev was, in fact, lied to by Washington about NATO expansion during negotiations to allow reunification of Germany. 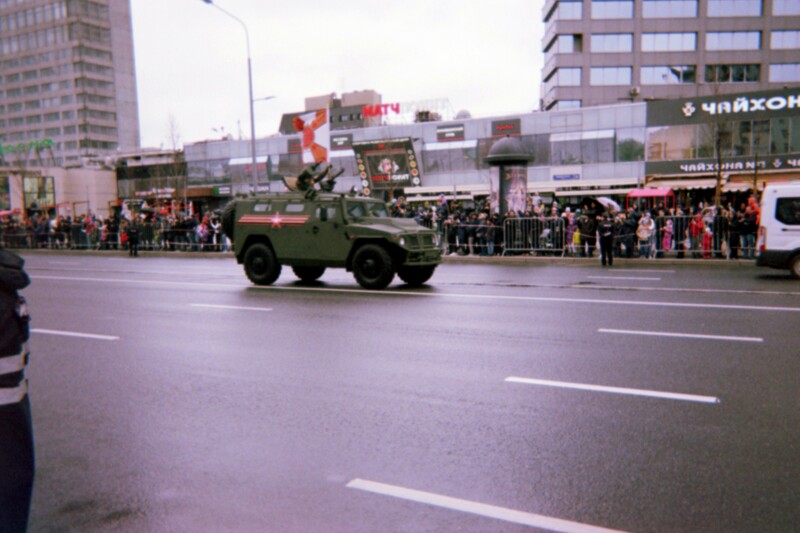 ….The first concrete assurances by Western leaders on NATO began on January 31, 1990, when West German Foreign Minister Hans-Dietrich Genscher opened the bidding with a major public speech at Tutzing, in Bavaria, on German unification. The U.S. Embassy in Bonn (see Document 1) informed Washington that Genscher made clear “that the changes in Eastern Europe and the German unification process must not lead to an ‘impairment of Soviet security interests.’ Therefore, NATO should rule out an ‘expansion of its territory towards the east, i.e. moving it closer to the Soviet borders.’” The Bonn cable also noted Genscher’s proposal to leave the East German territory out of NATO military structures even in a unified Germany in NATO. I don’t think it gets much clearer than that. Read the complete analysis and see the documents here. After the Trump administration received near-unanimous opprobrium from the UN General Assembly for officially declaring Jerusalem to be the capital of Israel, it seems to be no longer feasible to pretend that Washington is anything close to a credible mediator in the Israel-Palestine conflict. Of course, in reality, they have not been for decades as one cannot be a neutral arbiter when arming one side to the tune of $3-4 billion a year, enabling that side to implement its brutal and illegal occupation of the other. Moscow is ready to become a new mediator in resolving the Israeli-Palestinian conflict, the Russian deputy UN envoy Vladimir Safronkov said. He also added that Russia is ready to host direct talks between the two sides. Russia is ready to become “an honest mediator” in the Middle Eastern peace process, Nebenzia said at the UN Security Council meeting, after a resolution on Jerusalem demanding the US decision recognizing it as the Israeli capital be withdrawn was vetoed by Washington. In my opinion, Russia, China, the UN or some combination thereof would be more credible mediators. As I said last month, Trump would be a fool to arm Ukraine, so it comes as no surprise that this is what he has decided. While the U.S. isn’t giving Ukraine everything it was asking for, it is still recklessly throwing weapons at the problem. Russia will view this as a provocative act on our part, and it will respond with its own aggressive measures before long. When these weapons fail to have the desired effect, the drumbeat for sending more and more advanced weapons will start. Trump has already shown how easily he can be led by his advisers to endorse needlessly destructive measures. The U.S. will find itself caught in a fruitless and unnecessary competition with another major power that has far more at stake in the conflict. Because it has more at stake, Russia will always outmatch whatever support the U.S. provides, and so by adding more weapons to the mix the U.S. is simply fueling a conflict that it should be trying to resolve peacefully. Meanwhile, there has been an increase in the fighting in the Donbass, which of course, motivated German Chancellor Merkel and French President Macron to reiterate that the Minsk 2 Agreement was the only solution to the problem (as opposed to armed conflict) but publicly put the pressure on Russia to stop it. This is despite the fact that the Minsk 2 Agreement requires Kiev to take the next steps in resolving the crisis, which it has steadfastly refused to do for a long time. “Allowing such a significant number of people, who have been held on both sides, to return home before the New Year and Orthodox Christmas is a very welcome development. Today’s exchange is not only a humanitarian act but also a helpful step in confidence-building. We encourage the sides to continue their efforts to improve the life of people directly affected by the conflict”, said Chairperson-in-Office Kneissl. ….Kneissl and Greminger stressed that today’s exchange of prisoners, together with the lower number of ceasefire violations during the last several days, represent a step forward. ….In a parallel development, Iran is bound to join the EAEU as early as February, according to Behrouz Hassanolfat, director of the Europe and Americas Department of Iran’s Trade Promotion Organization, as quoted by the Islamic Republic News Agency (IRNA). ….As much as Beijing in relation to its BRI [One Belt, One Road Initiative], Moscow has been on a charm offensive to enlarge the EAEU. Turkey – already on board the BRI – is a possible EAEU candidate for the near future, as well as India and Pakistan. The first thing one sees to their right as they begin the descent down into Moscow’s largest airport is the sun glistening off the Moscow River surrounded by lots of greenery. It gave me the pick-up I needed after an exhausting 24 hours of minimal sleep, being crammed on several airplanes and literally running from one end of an airport to another because my first flight was almost 2 hours late and nearly made me miss my connection. 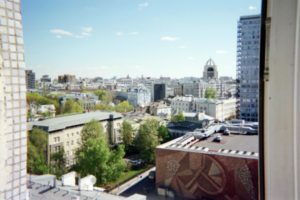 We were blessed with sunny weather in the Russian capital, which was a welcome change from the rain and dreariness at both New York and Paris. 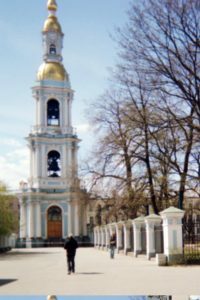 After departing the airport, I had to snicker in the back seat of our cab as my travel companion, who had never been to Russia before, became frazzled over the high speeds and improvised lanes that one sees on some of the major roads in Moscow. Our taxi driver, a young military veteran who works in the veterinary profession and drives for extra money on the weekends, kept getting an earful from my friend but took it in stride. Having settled in later that evening, I heard music at various times out in the distance from our apartment, alternating between classical piano and a lady’s voice singing. I couldn’t pinpoint exactly where it was emanating from, but it was pleasant nonetheless. On Sunday morning, just before 10:00 am, as I was sitting in the kitchen drinking my tea, enjoying the breeze through the open window on another sunny day, I heard the lovely sound of church bells ringing followed by a beautiful piano sonata. About a half hour later, I ventured out to the street where many spectators were standing along the sidewalk waiting for the procession to pass by in rehearsal for Tuesday’s Victory Day Parade. Lots of families were out with little ones in tow and babies were being pushed in strollers as I made my way to a small grocery a couple of blocks down to buy a few necessities. By Tuesday, the weather was not holding up so well. Part of the parade route included New Arbat which is the street our apartment was located on, so I headed outside about a half hour or so before the start time and braved the cold. I was able to find a good vantage point to watch and take pictures, having decided that I wouldn’t walk all the way over to Red Square, reasoning that it would be too crowded and I likely wouldn’t be able to get in for a good view. I later learned my intuition was correct and that only people who have permission can actually get into the square on Victory Day – probably officials, foreign dignitaries and special guests. More people came out to line the damp streets as the time drew near. Lots of families, people with their phones out ready to snap pictures, and a smattering of individuals waving Russian flags thronged the edge of the modest barricades and tape that separated the spectators from the road. In terms of security, the atmosphere was fairly low-key. Police officers were stationed every 25-30 feet. At one point I spotted an officer on the roof of one of the buildings across the street surveying the scene. When I looked up again a while later he was gone. Many officers wore wind breakers and some had on rain coats. City officers generally don’t carry guns. There was no riot gear. 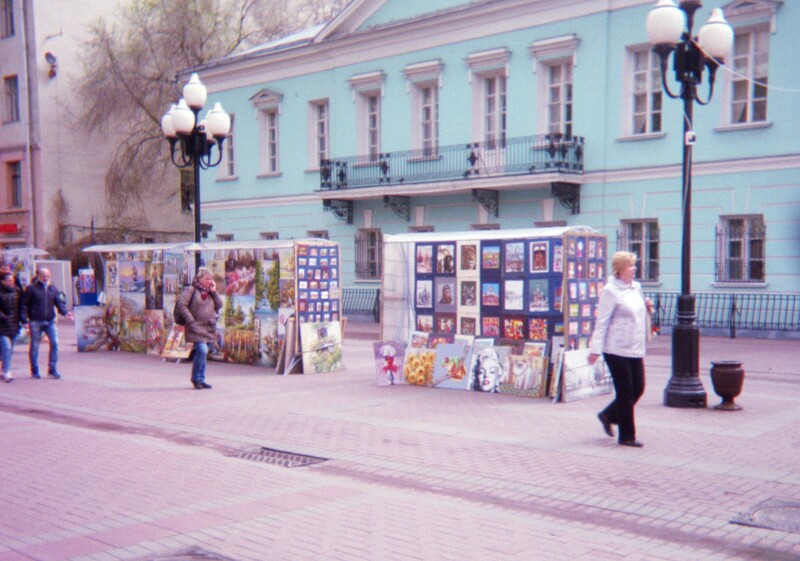 As people waited, earnest Russian music spilled out of loudspeakers. Then the music stopped and a brief announcement was made. A short motorcade of military officers in their crisp uniforms drove by about 5 minutes before the rest of the procession of tanks and other military vehicles began their ride down the street. Some soldiers in the procession waved to the cheering crowds as they rode by, sometimes honking their horns. The holiday celebrations concluded with a fireworks display at 10:00 pm, which I watched from our kitchen window as the balcony was too crowded with other residents from our floor of the building. Fireworks could actually be seen in different parts of the city, but the largest display lit up over Red Square and the Kremlin. When we flew into Russia, in 1945, I did not see a house standing between the western borders of the country and the area around Moscow. Through this overrun region, Marshal Zhukov told me, so many numbers of women, children and old men had been killed that the Russian Government would never be able to estimate the total. Although many Americans and Europeans have been bombarded with the America-centric rhetoric of the U.S. winning WWII in Europe, it was not controversial in the aftermath to acknowledge that the Soviet Union had, in fact, broken the Nazi Wehrmacht, likely saving many American lives by bearing the brunt of the fighting as one of FDR’s advisers had talked him into going into North Africa in late 1942, which significantly delayed the U.S. opening up a western front attack on Germany. Russia solemnly commemorates Victory Day each year with elaborate parades in major cities, like Moscow and St. Petersburg. The Russian president gives a speech before the Moscow parade and the parade is followed by the Immortal Regiment Rally in which Russians march through the streets carrying photos of family members who fought and/or died in the Great Patriotic War. I met my guide Natasha outside of the apartment at 10:00 am to begin our all-day tour of Moscow. We went around the corner to the bus stop across the street from the American Embassy. The bus took us close to our first destination of the day. 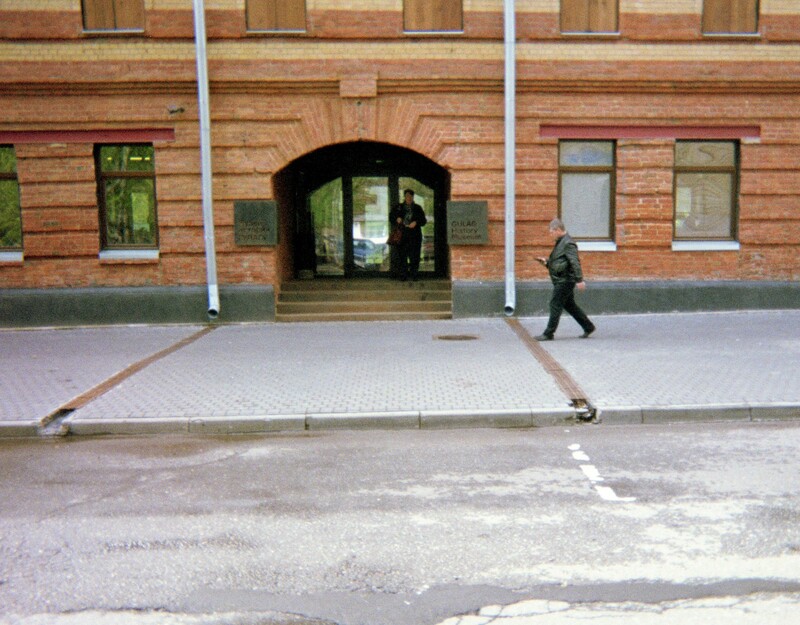 The Gulag Museum is a large red rectangular building with numerous windows covered with closed wooden shutters. This is the first unsettling clue of what awaits inside. 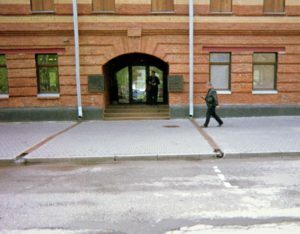 The Museum, which was moved to this area from its former location closer to central Moscow a couple of years ago, is now open to individual visitors for self-guided tours, whereas before only group tours were accommodated. Natasha explained to me that this new iteration of the Museum was more elaborate, having been designed by professionals for a more realist atmosphere and the addition of more artifacts from the actual prison camps. In the first dimly-lit room was a large four-sided frame with about 8 to 10 actual doors from Gulag cells affixed to three of the four sides. Each door included a card, in both Russian and English, stating which camp the door was from. The worn and pock-marked doors were made of wood, metal, or a combination of both. Most had a small square window that opened out in the middle, presumably for the passing of food. All had sliding bars and heavy locks. The fourth side of the frame was open and I could see the interior of the doors – the side the prisoners saw for hours, months or years – that is, when they weren’t toiling in the extreme cold. Various artifacts from the Gulag prisons could be seen hanging on the walls of this same room, such as a prisoner’s shirt, a small lantern from a cell, metal beds and benches, and a pair of handcuffs. On one wall was a schematic illustration of one of the gulag prison camps before it was constructed. In the next room were several glass cases. One displayed fragments of letters written by the prisoners on cloth, typically parts of clothing, as they were provided no paper. Another displayed pieces of wood with messages written on them by the prisoners, demonstrating their need to communicate with anyone who might see it. One case had items that had been made by some female prisoners, such as a utility box and shoes, constructed from whatever materials they could get their hands on. In another room was a long table with photos and biographies of prisoners who survived the camps and wrote about the experience. A copy of some of the books written appeared in front of the author’s picture. Of course, the most recognizable was Aleksandr Solzhenitsyn. The second to last room I was in had 3 video screen displays on one wall. The middle screen had a continually scrolling list in white against a black background of the names of those who’d been executed directly during the Great Purge of 1936-38. This would have been 700,000 to 750,000 people out of the 1.5 million that were arrested during that period. The screen on the left had photos and a brief description of certain prisoners along with the dates of their arrest and execution. These people were engineers, teachers, military officers and other average people – all of whom had been declared “enemies of the people.” I stopped to study the faces of a few of these individuals – one man in particular stood out to me because of his sad eyes. I wondered if the photos were taken at the time of arrest (did he know his fate?) or if they were just everyday photos that may have been available. The screen on the right had portions of actual lists of those to be arrested and executed projected on to it. After Stalin’s death in 1953, Nikita Khrushchev denounced Stalin and gradually released all of the prisoners, shutting down the Gulags and implementing a program of re-integration. Khrushchev later admitted that he’d had much blood on his hands from the Stalin era, but that he and many others knew that if they resisted they likely would have also been executed. Natasha and I sat on the bench in front of the television talking about the video when a young man from Kazakhstan briefly joined in our discussion. Upon realizing that I was American he politely asked me some things about the United States, including Guantanamo prison. I answered his questions as best I could. He also mentioned that there were people in Kazakhstan – a part of the Soviet Union at the time – who lived in the old buildings there that had constituted some of the Gulag prisons. When Natasha and I expressed surprise at this, he simply replied that the buildings were sturdy so people put them to use. 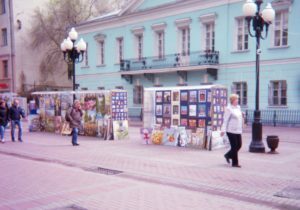 Exhausted, we finally left the museum and went over to the old Arbat street, a charming area that had been closed to auto traffic in the 1990’s and turned into a pedestrian thoroughfare with shops, gardens, restaurants and sculptures. We passed by the Pushkin monument comprised of statues of the poet and his wife. 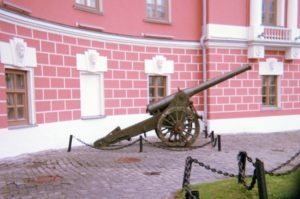 We stopped for lunch at a Russian buffet style restaurant and I asked Natasha her opinions about the Revolution, what alternatives (if any) might have prevented the Bolshevik coup in October of 1917 and the subsequent repressions, culminating in Stalin’s “concentration camps” and mass murder. 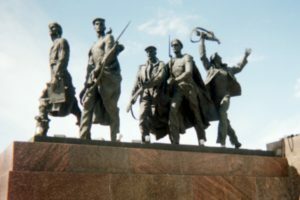 We discussed Nicholas II’s tragic incompetence and whether the February Revolution, led by social democrats, would have had potential if it had been allowed to run its course. We also talked about the Monument to Victims of Repression, aka The Wall of Grief, which will commemorate Stalin’s victims. 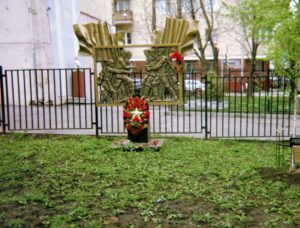 I had originally requested to see this monument as part of the tour but was told that it would not open until October 13th, which is the officially designated day of remembrance for victims of repression in Russia. 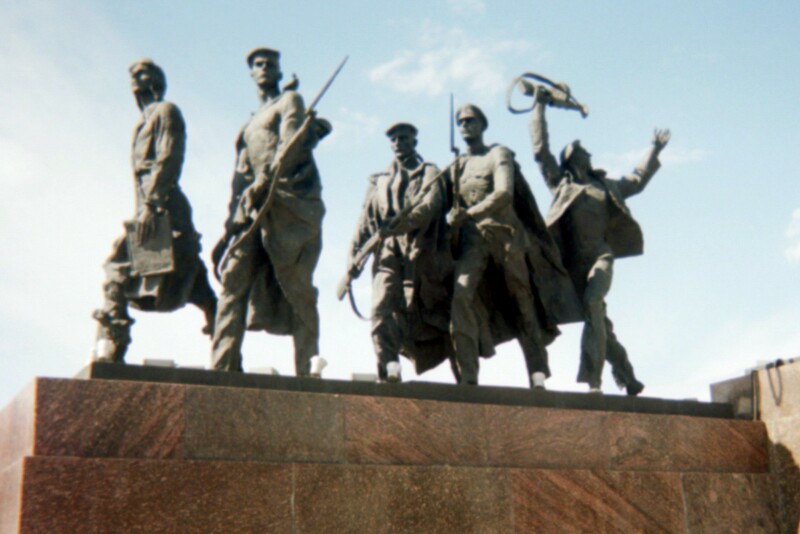 Reportedly, Putin played a key role in getting this monument approved. Despite Western depictions of Putin as a dictator, he must arbitrate among different powerful factions when making his decisions. I imagine there were some factions that weren’t too keen on this monument. Most Russians, in fact, do not view Putin as a dictator since they know what real dictators look and act like. 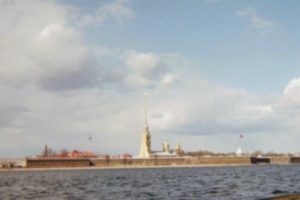 A Levada Center poll from last year reveals that 66 percent of Russians consider themselves to be free and do not believe Russia will return to dictatorship. Generally, the Russian president is seen as a strong and effective leader. I remember speaking to a group of professionals in Krasnodar during my first visit who insisted that a strong leader was needed to get things done. But they also insisted that the leader needed to be accountable to the people and their needs. As reflected in Putin’s consistent approval rating above 80% – even according to independent polls – over the past few years, apparently most Russians believe he meets this criteria. This is not to say that Russians are totally uncritical of Putin either or that they are afraid to express any criticism of him – that was not my experience during either of my visits. Moreover, Russians are an educated people with just over half of the population holding a college degree – compared to about a third of Americans – and everyone I spoke to on both trips acknowledged that they have access to western media through satellite and the internet – though they were bemused by the west’s cartoonish portrayal of their country and their leader. Simply writing Russians’ generally positive views of Putin and the progress Russia has made since the 1990’s off to government propaganda would be a mistake. According to interviews I conducted in person and questionnaires answered by Russians I networked with during my visit, most credit Stalin with the industrial buildup and leadership necessary to save the Soviet Union from the Nazis, while acknowledging the brutality and excesses. 400 artists competed for the opportunity to design the Wall of Grief. The winner, Georgy Frangulyan, has designed a bronze wall that will have the names and figures of the victims. The Wall of Grief monument will cost around 400 million rubles and will be placed in the center of Moscow at the intersection of Sakharov Avenue (named after the famed Soviet dissident Andrey Sakharov) and the Garden Ring. After lunch, we visited a park where the Elbe Monument was located. Dedicated in April of last year, the Elbe Monument commemorates the meeting up of the US and Soviet armies on a broken bridge over the Elbe River near Torgau in Germany on April 25, 1945. The monument was much smaller than I expected and was one of several sculptures by the same artist at this location. Right next to the Elbe Monument is a sculpture of Abraham Lincoln shaking hands with his contemporary Alexander II. Alexander II, the reformist Czar, freed the serfs in Russia in 1861 and Lincoln freed the slaves by 1865. Alexander II had also sent naval support to the Union during the Civil War. Both were later assassinated. We then took the Metro to another part of Moscow to go to the Museum of Contemporary Russian History which had a special exhibit on the Russian Revolution A bright young man guided us through the exhibit while Natasha translated. We concluded with an interesting conversation among the three of us about what might have averted the Revolution, Lenin’s motivations, what fueled his fanaticism, and whether he knowingly received assistance from the Germans for his journey from western Europe back to Russia in April of 1917 after which the Bolsheviks overthrew the Provisional Government. Subsequently, the Bolsheviks signed a peace treaty with Germany under terms that were widely seen as humiliating to Russia. 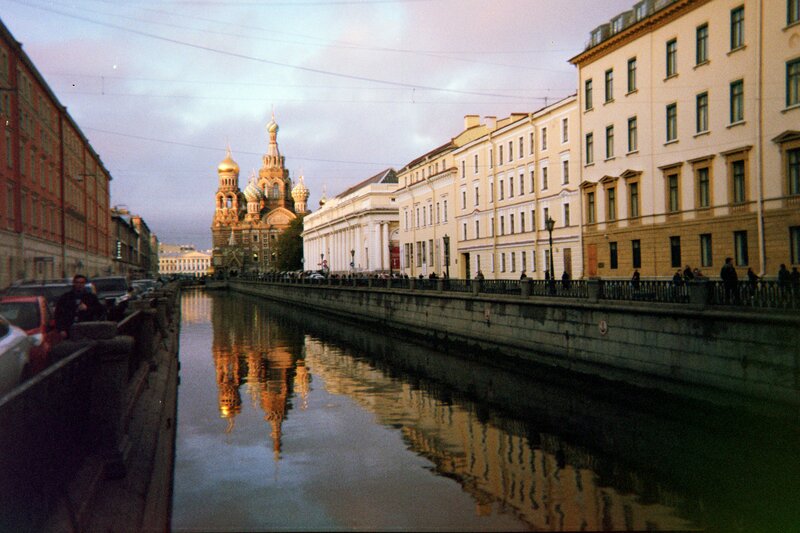 The next day we took a 4-hour train ride to St. Petersburg. The train was clean, modern and fast. After settling in, I looked out the window to watch the scenery, which included a lot of open land, with birch forests and salt marshes. There was a stretch where dachas dotted the landscape, some so diminutive and colorful they reminded me of dollhouses. 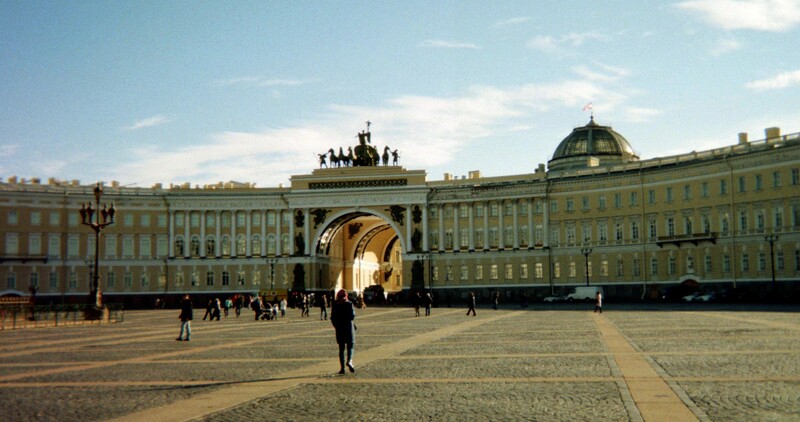 We originally planned to visit the Hermitage on our first full day in St. Petersburg but since the weather was nice we decided to go sightseeing instead. My friend and liaison, Misha, a native of the city known as The Venice of the North, drove us around to some key landmarks. 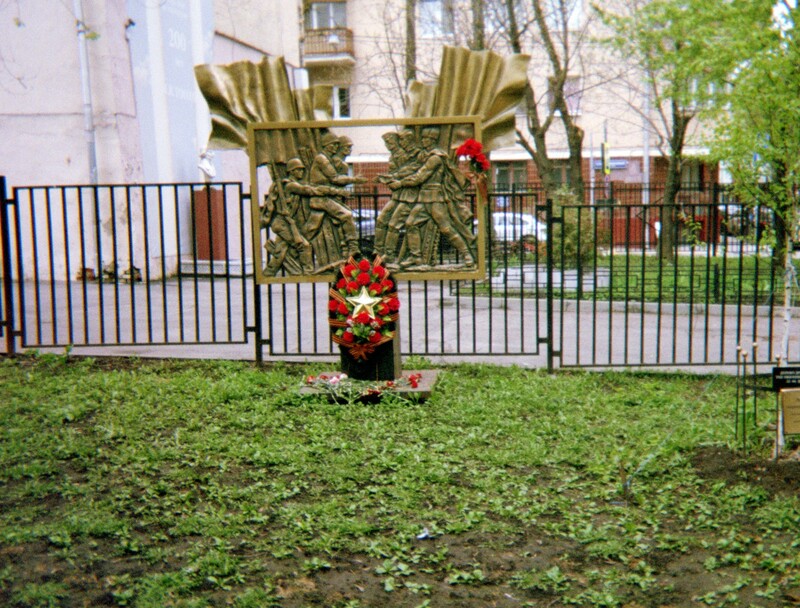 One of these was a park that included the Immortal Flame, which commemorates the Great Patriotic War. 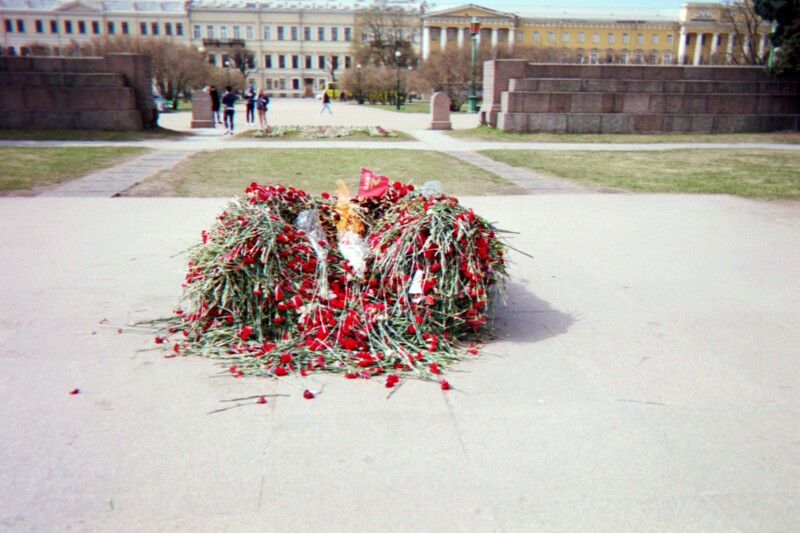 The Immortal Flame was framed with an abundance of roses that had been recently laid down for Victory Day. An older man on a bike stopped for a moment to pay his respects, while a pair of young women quietly snapped photos with their phones. I walked around with my camera and saw families on picnics and couples strolling by. 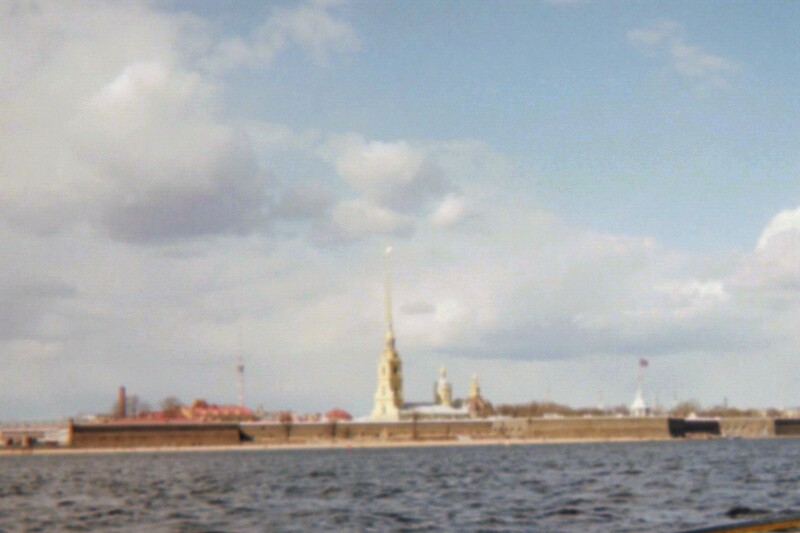 After a short walk near the Aurora ship on the dock of the Neva river where an old man sat playing the accordion and a handful of Russians dressed in imperial era costumes milled about, we stopped for lunch at a Georgian restaurant at the request of my travel companion. The restaurant was named after a Georgian painter of the primitivist school and the interior was elaborate, with a mural on one wall exemplifying his style, a fountain and fancy furniture. Like his 20th century counterpart, Stalin, Peter meant to drag what was perceived to be a lagging nation kicking and screaming into modernity. The human toll of making this magnificent city a reality is estimated to be in the thousands. I was tired from the day’s outing but had my first formal interview on the Russian Revolution scheduled with an 86-year old retired engineer who’d worked in the shipping industry. This was part of my project to interview a cross-section of Russians to get their views on the 1917 Revolutions since it was the centennial anniversary. I had formulated a series of questions to ask my interview subjects: were the Revolutions overall positive or negative for Russia and why, what did they think of Nicolas II, Lenin, Stalin, etc. This gentleman had given interesting answers about the Revolutions, his assessment of Nicolas was typical – he was weak, incompetent and completely ill-equipped to deal with the historical moment he’d been faced with, and he offered some thought-provoking points about Lenin, though he clearly was not a fan of the Bolshevik leader. However, he lingered a long time on the issue of Stalin, elaborating more on this question than any of the others. At one point, his hands gripped the corners of the table. I was debating whether to ask if anyone in his family had been affected by the mass repressions. On the one hand, it is a legitimate question in terms of my research, but another part of me cringes when a question goes beyond discussing something in the abstract and crosses over into personal territory that will dredge up something painful. I was mystified by the sealing off of the bookshelves and asked if there was any explanation for this. He explained that his father was a talented mathematician and geologist, had written several books and had a leadership role in several scientific societies. When an individual was arrested, any items of particular value were confiscated. Since his father was an intellectual and a writer, his books were taken and the bookshelves rendered unusable. Before I realized it, 2 1/2 hours had gone by since we arrived at his apartment. I recall one moment, after we’d gotten through the worst parts of the interview, looking out the window at the first signs of dusk. The clock beside the window indicated it was 9:30 pm. As we concluded our discussion, I expressed my condolences for what had happened to his family and my appreciation of his taking the time to talk with me about such a painful subject. He admitted that it was painful but that it needed to be talked about. He wanted to ask me a few questions as well. I realize that many Russians have very few, if any, interactions with Americans and when they do encounter one they are often curious and inquisitive. So I’m no longer surprised when this occurs. He asked me about certain aspects of what happened on 9/11 and what priority Americans currently placed on countering Islamic terrorism. Our second day of sightseeing began with a pretty blue and white church called the St. Nicholas Naval Cathedral, located only a couple of blocks away from where we were staying. It was often used by sailors and naval officers who would come to pray and receive blessings before embarking on a journey. The main church was open only at certain times and was mainly for the seafaring folks. Another smaller church building off to the side was open at all times and received anyone. 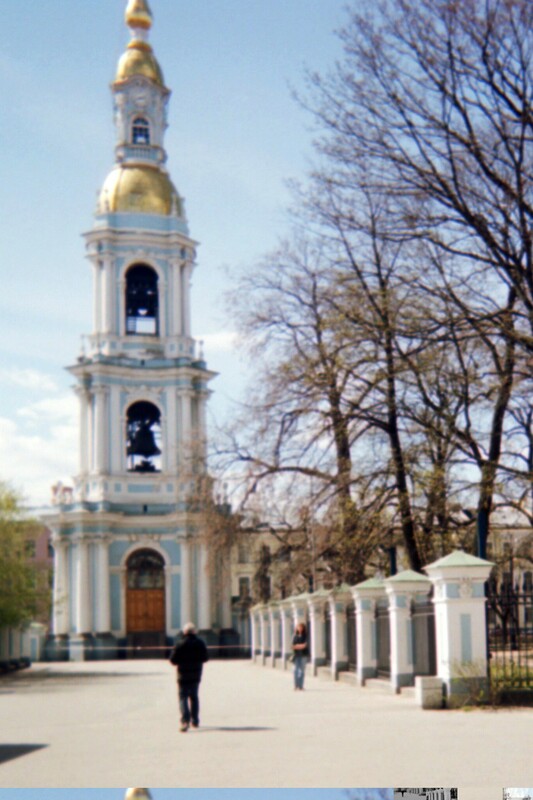 The church is still in use and a section is cordoned off for tourists and sightseers in which they can view the magnificent interior of gold and artwork. Only churchgoers are allowed to go beyond this point. I watched Russians light candles and pray. One woman kissed an icon as is customary in the Russian Orthodox religion. We then made our way over to the Church on Spilled Blood, which I’d been anxious to visit so I could see the interior. On my last visit I’d seen the splendid outer part of the church but didn’t have time to go inside. I’d heard that the mosaic artwork on the inside was amazing and was determined to see it this time. Since this was a Sunday and the weather was unusually gorgeous, the church was packed, so I kept my visit shorter than I normally would have as trying to maneuver my way within crowds tends to wear me out. But I was not disappointed by the church’s interior. The rich imagery on the walls and ceiling was beautiful, along with the set of marble steps that led to the altar and the canopy that covered the actual spot where Czar Alexander II had fallen when he was assassinated in 1881. The church was built as a memorial to him. Before being mortally wounded by a bomber from the terrorist revolutionary group Narodnaya Volya, the reformist czar had decided on a decree that would have set Russia on the road from an autocracy to a constitutional monarchy. But the assassin got to the czar before the decree was issued and his son, Alexander III, made no pretense as to reform, so the idea languished until the 1905 revolution when Czar Nicholas II would cede some power to a parliament – if only on paper.